This site is dedicated to the training of horse and rider enabling them to become one, working together to achieve a common goal, that of enjoying each others company whilst respecting each others needs. No body can enjoy the company of a person who is demanding, bossy, loud and rough. Nor can one enjoy the company of someone who constantly disrespects you and your needs. It has been said that good riders can make thier horses do anything or go anywhere, better riders will say that they can tell their horses to do the same, but a horseman can whisper and their horse hears and understands. Click here for a quick review on the reasons for Natural Training. You've all heard the stories about riders who will tell you that if your horse stops obeying your commands a harsher bit is required, and yes you can buy them, but this rider is a poor partner to his horse. A horseman would tell you that the only bit a horse requires is a bit more training. This site is to help you, the horseman, gain that training and help you work with your horse. Currently this site is being updated with new video training sections and shorter training text. At the moment we are tying to add a new video each week or so, starting near the end of August 2014. 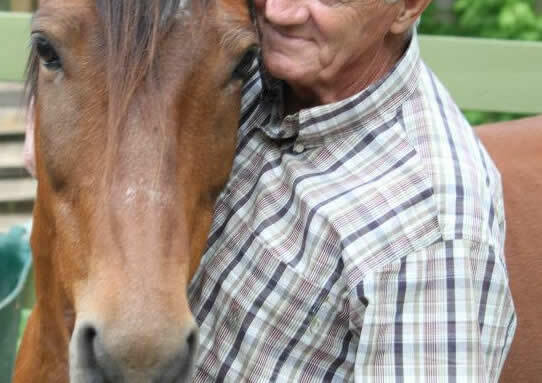 I hope this will give you a better insite into Natural Horsemanship and How to Develop a Relationship with Your Horse.